The Source Vérité Vanilla Bliss Spa Basket is a gift that surrounds the body in an intoxicating essence that’s exotic, delicate and thoroughly romantic. Madagascar vanilla, sultry amber and notes of warm sandal and cedar woods infuse an invigorating shower gel, luxurious body lotion, hydrating body butter, relaxing bath salts and other gifts included in this comforting Spa collection. Source Vérité lotions and gels are made exclusively in the U.S.A. Arrives elegantly packaged in a chic, reusable woven basket with black matte handles. Send her a pampering birthday gift she can enjoy on her special day and everyday! 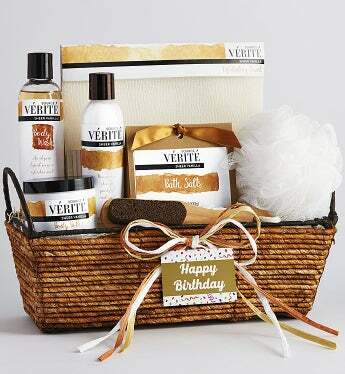 The Source Vérité Vanilla Bliss Spa Gift Basket is a gift that surrounds the body in an intoxicating essence that’s exotic and delicate. Madagascar vanilla, sultry amber and notes of warm sandal and cedar woods evoke a mood of relaxation with this comforting Spa Collection gift. Give her a moment of true bliss!